The great enlightened being Phabongkha Dechen Nyingpo said that the time is very degenerate, with an explosion of the five degenerations, delusions become stronger and harder to abandon. In such a degenerate time, Medicine Buddha and Heruka are two very precious deities to practice; from the sutra, there is Medicine Buddha, and from Highest Yoga Tantra, there is Heruka. The blessing of the practice becomes more and more powerful at this time. This Medicine Buddha is equal to all the buddhas and bodhisattvas. Their life, holy activities, duration of their teachings and power of their blessings are equal. This buddha’s compassion and prayers working for sentient beings are equal to other buddhas. This buddha is the embodiment of all the gurus, Buddha, Dharma and Sangha. It encompasses Those Gone to Bliss. It is the embodiment of the Triple Gem, the mind-seal deities, the dakinis and the Dharma protectors; it is the embodiment of all the objects of refuge. This one Victorious One encompasses all. Therefore, there is no doubt that if, with strong devotion, you make prostrations, offerings or requests to Medicine Buddha, or even hear the name or see a holy object of this buddha, or merely remember them, you will be saved from the sufferings of the lower realms. 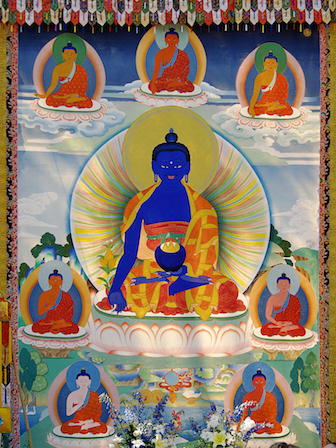 One of the benefits of Medicine Buddha practice is that it helps to bring success. It helps to bring prosperity, both in spiritual practice and materially. Medicine Buddha practice is also powerful purification. It is one of the best things to do for someone who has passed away. It is not only for sickness, it is for anything. Jhado Rinpoche will be giving teachings on the Medicine Buddha, based on the a short self generation practice text. At Rinpoche’s advice, we will be doing the Medicine Buddha retreat from Feb 8–15. We will be accumulating 10,000 long Medicine Buddha mantra (Om namo bhagavate benkhandze guru baidurya…) plus 10,000 wisdom showering mantra and concluding with a fire puja for those who had completed the mantra accumulation. This is an incredible opportunity to do the retreat under Rinpoche’s guidance. Join us! A limited number of rooms are available, please call the front office at 831-462-8383. Dinner is available for commuters. Please call the office by January 29 to book your meals. Participation: No restrictions. All are welcome!